“Doing business without advertising is like winking at a girl in the dark. You know what you are doing, but nobody else does” – Steuart Henderson Britt. The importance of digital marketing and having a web presence is rammed down the throat of every small business. We all have websites, Twitter accounts, Facebook pages and a myriad of other social media accounts; but what about press releases? Do you use them? Do you know how to issue them? Until a few weeks ago Pixalytics’s answers to these questions would have been: No, No and No! We’d had people saying we should issue press releases before, but to be honest we weren’t sure we had anything to say, or whether anyone would be interested. The first press release occurred in 1906 when journalist Ivy Lee suggested that the Pennsylvania Railroad should issue a statement about what had happened following a train accident. They did and the press release was born. Today, pick up any newspaper or trade magazine and you’ll find stories about what large companies are doing issued by marking or communication departments. If you’re a small business like ours, then we are the salespeople, finance team, administration staff and the people who deliver the products and services – of course we’re also the marketing and communication part of the company too! So spending time on press releases means something else gets delayed or doesn’t get done. In terms of our marketing, we issue a weekly blog and try to Tweet on a regular – well, fairly regular – basis. We also network and market ourselves at meetings and conferences, and we support/sponsor occasional events – have a look at our blog from 12 months ago about us sponsoring a Formula 1 Team. 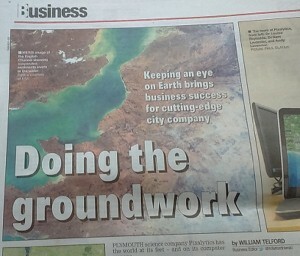 This is about as much as we do; but we recently decided to have a go at getting press coverage. The first thing we learnt is that businesses of any size can have newsworthy items, and we felt our book and first employee might be of interest. For the book we focussed on getting the article into a trade magazine, and once we’d chosen the magazine we researched the style of news article they published. We then put together a short press release, which was really just a paragraph about our book, found the name of editor and submitted it by email. For the first employee, we contacted our local paper to see if they were interested in doing a story about a growing company. As simple as that, all in all about an hour’s work. So how did we do? The image at the top is a headline from today’s (Wednesday 25th November) local paper, which has a great double page profile article written by William Telford, Business Editor. The news item about our book is already on the website of the GeoConnexion trade magazine website, and it hopefully will appear in the January print edition too. Will it generate more business? Will it promote our brand? Who knows? It will give us publicity and it was fun to do. We’re definitely going to do more in the future. Target the key newspapers or magazines you would like to get into, don’t send your press release out everywhere. Find out the name of the journalist or editor, and talk to them – remember these people are actually looking for news articles! Research what they are interested in and submit relevant pieces. Include a picture or image. Don’t forget to leverage any publicity using social media! If you have not sent out a press release before, then give it a go. What have you got to lose? 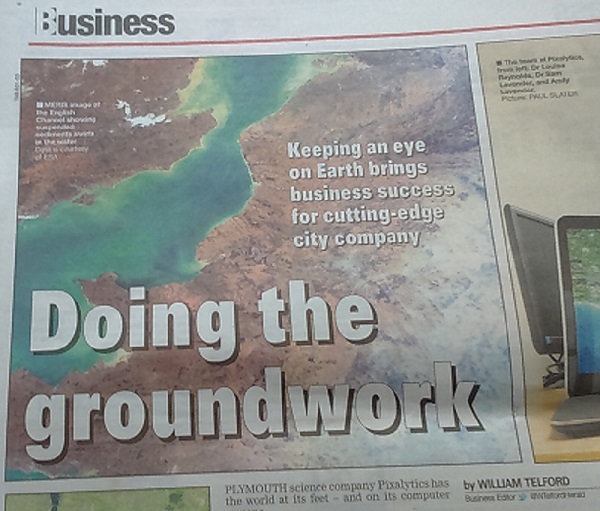 This entry was posted in Business Innovation, Earth Observation, Growth, Micro Business, Remote Sensing, UK Space Industry and tagged Business Editor, GeoConnexion, Ivy Lee, pixalytics, Plymouth Herald, press release, small business, SMEs, tips, William Telford by Andy. Bookmark the permalink.